Whether you need a new system, system repair or want your system upgraded to LED, we are your best choice. We’re based in North Atlanta and most of our work is in the area. Every service listed on this page is discounted for North Atlanta residents. 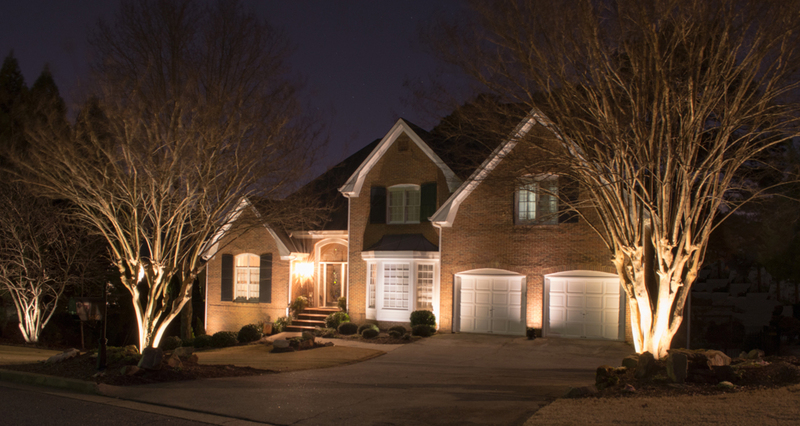 Alpharetta area home with up-lighting on house and trees. Click for a larger view. Call for our other larger package specials. We only install brass fixtures that carry a lifetime warranty. We can convert most systems to LED. Bulbs last 8 times longer. Conversion cost based on your particular system. Not sold on LED? Read our article on why you need to convert today. LED lighting will save you substantially on your power bill. Check out our Outdoor Lighting Cost Calculator. Let us beautify your home for the holidays – Ask about our Holiday Lighting Packages! We have such a happy customer community that they gladly refer us to their friends and neighbors. As a way to ‘give back’ and encourage our happy clients to refer their friends we created the FittyBux program that rewards clients who refer us and new customer who receive the referral. Read all about it here.